On May 9, the current Mayor of Jakarta, the capital of Indonesia, Basuki Tjahaja Purnama, better known by his nickname Ahok, was sentenced to two years in prison on charges of violating the law on blasphemy, which was adopted as far back as 1965 to maintain religious tolerance and guarantee the protection of religious freedom in the country. The law states that any individual found to be showing hostility towards the feelings of believers is liable to be sentenced to up to five years in prison. The law is valid for six officially recognized religions in the country, although it mostly affects those who are found guilty of “blaspheming” Islam. Approximately 90% of the population of Indonesia, numbering 255 million people, professes Islam. However, for the last fifty-odd years, only a few have received actual sentences for insulting the feelings of believers. According to the Setara Institute, for the period from 1965 to 2017, 97 criminal cases were opened under the designation “blasphemy”. Most of them fell during the presidency of Susilo Bambang Yudhoyono (President of Indonesia from 2004 to 2014). In 2012, a Sumatra official was sentenced to two and a half years in prison just for declaring himself an atheist on Facebook. However, the accusations of blasphemy against Islam being levelled against Ahok is a special kind of phenomenon, and not only because the politician of such a high rank, closest friend and associate to the country’s president, Joko “Djokovi” Widodo, is in the dock for the first time. What matters is that such a trial has become possible in the country that has always been famous for its religious tolerance, but now has shown hostility towards a man who has Chinese roots and professes Christianity, only because he allegedly misinterpreted the Quran. And this is a dangerous sign, testifying to the growing process of the Islamization of Indonesia, where the majority of the population adheres to moderate Islam. Ahok is seemingly paying the price for a statement he made in September 2016 during his election campaign for reelection as Mayor of Jakarta, in which he announced to his constituents that his political opponents were deceiving people using the Al Maidah verse from the Quran to argue that Muslims should not be governed by non-Muslims. In actuality, Ahok only said, “You can’t vote for me because you’re being lied to by [the Quranic chapter] Al Maidah verse 51 and so on. That’s your right. So if you feel you can’t vote [for me] because you’re afraid to go to hell after you’ve been dumbed down, that’s fine. This is your personal calling.” From the perspective of the Islamists, Ahok insulted the Quran. A recent poll conducted by Saiful Manjani Research and Consulting (SMRC) showed that 45% of Indonesians believe that Ahok’s words are blasphemy. However, 88% of the respondents across the country said they had no idea of ​​how the Mayor of Jakarta was referring to the Quran. In any case, all it took was to launch an edited video of his speech on the Internet, along with the relevant comments of radical Muslims, which immediately incited an angry crowd of thousands of people to go out onto the streets of the Indonesian capital and demand that Ahok be brought to justice for his blasphemy. What is more, these events happened at the very moment Ahok was winning his pre-election race. There is no doubt that these protests in Jakarta, which ran from November 2016 to March 2017 and involved up to 500 thousand active participants, were well organized. The recently formed coalition of Islamist groups (the National Movement to the Guard the MUI Fatwa – GNPF-MUI) actively participated in preparing and organizing the protests. This movement also included representatives of the extremely radical Islamist organization Islamic Defender’s Front (FPI.). Likewise, the manipulation of public opinion has become an instrument in the political struggle for power, which in April 2017 ended in the defeat of Ahok and the victory of his chief rival, former Education Minister Anies Baswedan, supported by the opposition leader Prabowo Subianto and the Islamist Prosperous Justice Party. Baswedan will take up the post of Mayor of Jakarta in October. The thousands of protests, and most importantly, the sentence passed to Ahok, give rise to many fears about the prospects for the future development of Indonesia, the world’s largest Muslim country. There are very pertinent questions on whether the rapid Islamization is threatening the country and whether the influence of radical Muslims on the country’s politics is increasing. Indeed, there are many reasons to be concerned. The fact that nowadays, believers in mosques are speaking about the possibility of killing Ahok, is only one of the real manifestations of the strengthening of radical Islamic beliefs in the country. The lukewarm Islamization of the country began gathering momentum during the ten-year presidency ofYudhoyono, who opened the political space for the activities of radical Islamists, who, together with Widodo, were influential enough to enforce the blasphemy law against his closest ally when he lost elections. 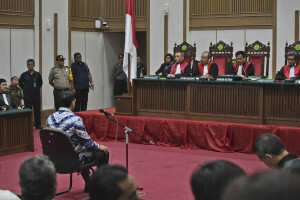 And this was despite the fact that the prosecution favored the sentencing Ahok to 2 years of probation (a house-arrest type of suspended sentence in which the convict largely remains free enough to make daily errands but is under the supervision of a service officer) instead of imprisonment, since his words were not found to necessarily contain intentional direct insults to the Quran. However, a five-person jury found the Mayor of Jakarta guilty of blasphemy and insulting Muslims and sentenced him to two years in prison. One of the judges, quoting Surah 51 of the Quran, openly stated that Muslims should not elect leaders who do not profess their religion. And the court unequivocally recognized the fact that non-Muslims do not have the right to interpret the Quran. From the point of view of strengthening the foundations of democracy and dividing the jurisdictions of the branches of power, his decision does look legitimate. On the other hand, by supporting the adoption of the blasphemy law against Ahok, a representative of Indonesian national and religious minority, he has endangered the fragile process of the democratization of the country, which largely depends on the preservation of a pluralistic and secular state, and broadened the political space for the activities of radical Muslims who want to see Indonesia an Islamic state.